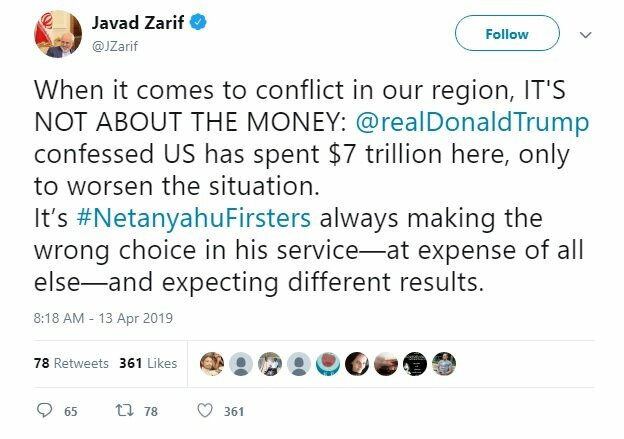 When it comes to conflict in our region, IT'S NOT ABOUT THE MONEY: Donald Trump confessed US has spent $7 trillion here, only to worsen the situation," Mohammad Javad Zarif wrote in a tweet on Saturday afternoon. The top Iranian diplomat added that the US president's costly and wrong support for the Israeli Prime Minister Benjamin Netanyahu could have repercussions. It’s Netanyahu Firsters always making the wrong choice in his service—at expense of all else—and expecting different results," he continued.